I will run them now. Last edited by nee4speed111; 07-26-2016 at 04:22 AM. Could someone run Neolithic Levantine and Bronze age Levantine? I've noticed the Gedrosia K13 puts Palestinians at 5.2% "SSA", passa's K10 at 6.36% "NeoAfrican", and this spreadsheet shows Palis at 4.44% "SSA". Yet my SSA/NeoAfrican for all these is 0.01%, 0.59%, and 0.00%, respectively. I know the Christian SSA is slightly lower but even going by those numbers my results are pretty low. 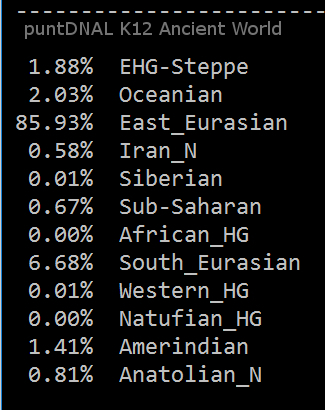 I think its likely a lot of the "Christian Arab" samples in the system are from Palestinans from Nazareth and the Northwest coast (Haifa etc), since they seem to be the most numerous, and also in closest proximity to Israeli labs. My guess is that in these more historically strategic areas (particularly the coast) the Christians are a little more cosmopolitan in genetic makeup than those Christians from the more insular Judean Hills and Bethlehem. This might have something to do with the prevalence of the otherwise-rare y-dna G1 among Bethlehem Christians. The % sign will be an issue when plotting. Last edited by E_M81_I3A; 09-18-2016 at 07:26 PM. A Calabrian and a Maltese are more SSA than a Samaritan, that's pretty interesting.